If you are NOT part of the Team Beachbody community yet, I offer myself, my friendship, my heart, my time, my energy and my love to you to help you not only lose weight, improve, look and FEEL healthy, but help you feel whole again, because we are all a little broken in our own way. I can’t guarantee or promise to “FIX” you, but I CAN provide you with all of the tools, guidance and support to help you on your journey to a better you. If you are a parent, who often feels resentful of the little time you get with your own children or are tired of being tired every evening, after a long day of work and are heartbroken over the fact that your children get the remnants of what is left of you at the end of each day, please take the time to see how coaching has improved the dynamics of our family and my relationship with my children and lets discuss the options you have which can bring you home to your family, where you belong. If you are a coach, I ask you to honestly ask yourself: From outsiders, would your level of loyalty & commitment to Beachbody﻿ be evident? 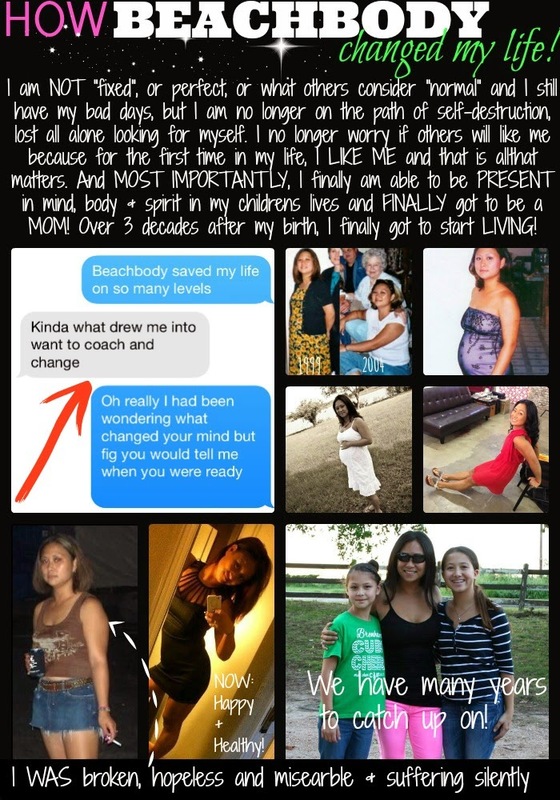 Has being part of the Team Beachbody﻿ community saved your life in more ways than one? If not, could it be because you have not fully taken advantage of everything available to you all coaches who are part of our organization? Do you attend events to meet other coaches and attend training workshops so that you can learn how to be the best coach possible and grow more confident as a coach? Do you engage in Personal Development? Do you interact with others in your team page or challenge group? Do you stay in communication with your coach? Do you set goals? Who holds you accountable? Earlier today, It dawned on me, that yesterday was the first time I, myself took care of Emily when she was sick, since she was about 2 years old. For the past decade, Ryan & Larry have been the ones to pick the kids up from school when the nurse calls, take them to the Doctor, administer meds, take temperatures, clean up puke. I hated that I was stuck at work and had to call to find out how my kids were. I always wondered if they wished I was there instead. I wanted to be the one to take care of them, but I never had enough sick time available or the flexibility at my places of employment to take off. In fact back in 2004, when I worked at a daycare, they wouldn’t let me off when my kids needed to go to the doctor or got sick. One morning when I woke up to find Haylie was sick, I called in and they threw such a fit, and made me bring Haylie in with me (who I had to send outside to throw up out on the playground, while I greeted parents as they brought their children in for the day) & another time when Emily was sick they wouldn’t let me leave when her fever hit. Looking back, thinking about how my 4 year old was outside throwing up, while I put my job first, taking care of other people children, it is fathers sickening, even more so that shortly after these incidents, they terminated me stating that I had too many absences even though many were accompanied by a Doctors Note. At age 24, after that experience, I began to sacrifice my duties as a mother because at the time, it seemed that in order to be a good parent, I needed to make sure I did everything I could to insure job security so that I could provide for them. BOY, do I ever regret all the time I’ve lost with my 2 oldest kids, all the events I showed up to late or had to leave early from because I had to get back to work, all of the cancelled Dentist and Doctor appointments that I couldn’t get the time off to take my kids to or find someone else to take them for me, all the times, I gave my kids Ibuprofen as I dropped them off at school, crossing my fingers that it kept the fever down for the full 8 hours so I wouldn’t get a call from the nurse, saying I needed to leave and pick them up from school. I shared this disheartening realization (that I KNOW is the reality of many working parents) with a few friends along with the fact, that I TRULY believe, that if I had not quit my job last November that my kids would not be who they are right now, our relationship would still feel awkward and strained. Had nothing changed, I am not sure how or when I would have had a chance to reestablish and repair my relationship with them. I have watched people who’s pride and procrastination caused them to miss that chance to right a wrong, say I’m sorry or I love you to someone that mattered, all because they were waiting for the right time or convenient time and time ran out and they never got that chance back and I did NOT want to be one of those people who tried to have a relationship with my children when they were broken, angry adults that had waited for me their whole childhood. I can’t imagine what I would have missed, what our relationship and the dynamics of our family would still be like, if I was still working full-time, feeling cornered into an unhappy life stuck on auto-pilot. I will be forever grateful for the opportunity to be able to come home to my family which allowed me to connect with each of my children. And because of the changes I had made since becoming a coach (because of being surrounded by successful, positive people and engaging in personal development) I was able to step back, take a hard look at the history of my parenting and skills. I immediately totally re-evaluated my priorities for my family and redesigned how we and why we did everything: the quality and amount of time spent together. the way I communicate, my expectations, my method of discipline, and how I run our household and identified the legacy I wanted to leave behind for my children. When I shared that Beachbody saved my life on SO many levels, it was a great feeling to know that my “general testimony” and #1 reason for staying LOYAL to Beachbody for LIFE, is not only evident to others outside of our household, but what has attracted, inspired and convinced someone that not only is this “not a SCAM”, “not a Pyramid Scheme”, “not just some weight loss company that sells a bag of shakes and DVD’s”, but something that can provide a solution to helping you repair, restore, renew and save relationships, heal from your past, learn to forgive others for wrongdoings that hold you back and forgive yourself for your own past mistakes and failures and can lead to healing your broken parts and make you feel whole. “I’ve watched you change in many ways: Emotionally, mentally, physically, your parenting, your relationships, your outlook on life… You’re just different and in a good way. I’m not married, I haven’t been in bad relationships, I don’t have kids , I don’t have Daddy issues, (maybe Mommy issues lol), but it doesn’t mean that I’m okay and not broken on the inside too. You think you were a train wreck. I don’t think that, Just damaged and needed to be fixed and well maintained.